Sabine's New House > Green & Eco-Friendly Products > UPDATE: Give your Home a "Nest"
“Nest” takes smart thermostat technology to another level: The Nest learns your heating and cooling settings/body desires over time (usually one week) and then automatically programs itself to those levels. Wow! Nest is simple to operate. It is affordable: $249.00 at BestBuy. New Nest shipments are scheduled to arrive in January. Be on the look-out because they will simply fly off the shelves. Installers are anxious to receive their allotments. Get yourself on their lists! One word of caution: Nest’s website proposes for homeowners to install their Nest thermostat themselves. Such DYI efforts are not the way to success for most homeowners. Interviewed heating and air-conditioning installation companies are expecting lot’s of calls on failed do-it-yourself installations. 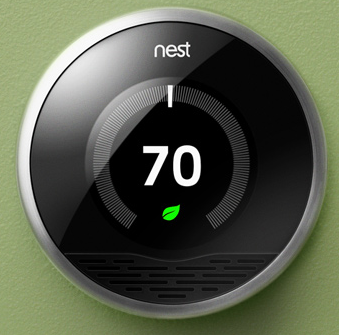 The development of the Nest thermostat is one more example of the ever rapidly progressing technology advancements in home improvement products…..INDEED!